Frontiersmen and frontierswomen were/are people living on the frontier between settled and unsettled lands. The frontier was a place between civilization and the unknown wilderness. Frontiersmen often cleared the land, built shelters, raised children, and grew crops. Hunting and animal trapping were prime sources of meat. Animal furs and skins were made into clothing. 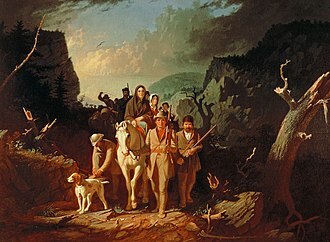 Famous American frontiersmen include Davy Crockett, Daniel Boone, and Kit Carson. The United States, Canada, and Australia are the countries where frontiersmen and women have been found in large numbers. This page was last changed on 10 October 2018, at 15:58.